Sonam Kapoor is getting married & this is what I think she will wear for it! Well, that cat is out of the bag finally and I literally can’t keep calm! Bollywood’s fashionista Sonam Kapoor is reportedly set to marry her long-time bae Anand Ahuja on May 8, 2018. Yes, Sonam Kapoor getting married people! This news is totally giving me #Virushka feels! Well Sonam, kudos to you for saying & doing so in spite of having all the money in the world to spend! According to reports, the sangeet rehearsals have already begun in Kapoor residence and Farah Khan has been entrusted with the responsibility of choreographing songs. The wedding is supposed to take place at Sonam’s aunt's house in Bandstand on May 8, 2018. The lavish mansion is close to superstar Shah Rukh Khan's Mannat and is beautifully designed. Reportedly, the reception will be hosted the same night at Leela. There’s also news that her sangeet and mehendi ceremonies will take place at Sonam’s BKC, Mumbai building and the festivities will start from May 7. Well well, with all these speculations going rife, I just can’t help but wonder what will be Sonam’s outfit choices for the same. I mean the B-town’s reigning fashionsta’s wedding is bound to give us some serious #OOTDgoals right? This yellow Abu Jani Sandeep Khosla anarkali is giving me total haldi vibes. What do you think? Or this yellow Anamika Khanna outfit is also just apt! Green for mehndi too mainstream for Sonam? Well I thought so, read on to what I think she might opt for! This is how me think-eth her mehendi look will be. A bit of maroons, some deep blues, some mirror-work and completely making a statement! With Farah Khan herself choreographing for the whole Kapoor clan, one can only imagine what the whole sangeet will be like. I am guessing it’ll be a vibrant outfit making a statement though. Or may be something pastel owing to the summers! There are a lot of designers that are being guessed Ms. Kapoor might pick for her taking her pheras. Will she be a Sabyasachi bride like her other counterparts? Or will she pick her go-to designers Abu Jani and Sandeep Khosla? Will she be a subtle Sabyasachi bride in ivory lehenga with floral motifs on it? Or will she be a Abu Jani Sandeep Khosla bride in a classic red lehenga? Well, there are a lot of names coming up for this one too, my money is on Ralph and Russo without any doubt! 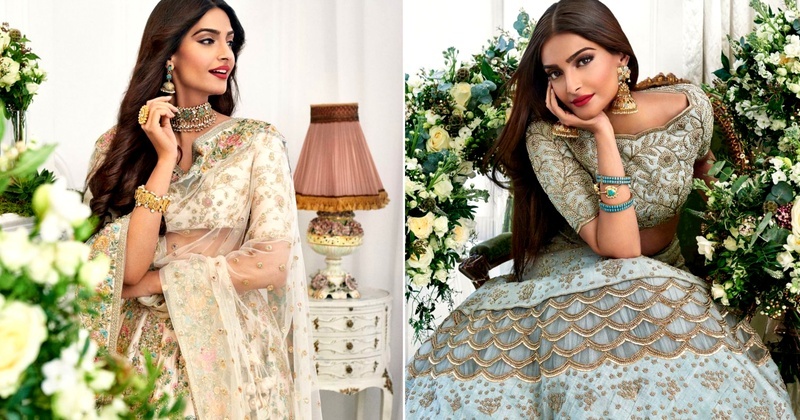 Here’s hoping Sonam Kapoor will break down all the expected #ShaadiWear traditions giving us a complete makeover on what a millennial, independent and super successful gal should wear for her wedding! Also, if anyone knows that Sonam Kapoor is having troubles getting her wedding-wardrobe in line, be a doll and totally refer this blog to her!